If you want a fun passport cover for kids or adults then check out this Cute Bunny Passport Cover. 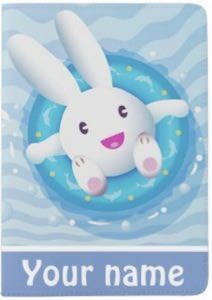 This passport cover shows a cute white bunny on the front and it seems to be having a pool party and it just looks really cute. To make this just the perfect cover for your passport then this is it as below the cute bunny it has your name printed on the cover (at no extra cost) and that makes it easier to spot in a stack of passport your family may have. And this passport cover is waterproof and sturdy to keep your passport look like new. And this cover is 5.25 x 3.75 inches and that means it fits most passport including the one from the US and Mexico. Now there is this personalized cute airplane passport cover. 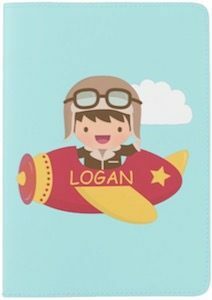 The passport cover shows the sky on the front with a little fluffy cloud in the background and then there is a cute little plane with a boy in it and on the plane it will have your kids or maybe your name on it so that you always know who’s passport is inside it. On the back of the passport cover it shows a pilots badge in the same colors as the plane. 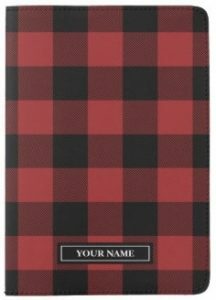 Not only does this passport cover look cute it also protects your passport from harm as it is sturdy and water resistant. Suitcase and bag handles are often just not comfortable to hold and that is why this Union Jack handle wrap is just perfect for you. 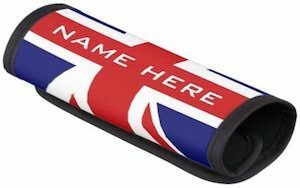 And this flag handle wrap is not just the flag but as you can see it can hold you name on it too (no extra cost) so you can choose to have just the British flag or the flag with your name on it. The neoprene handle wrap will make it way more comfortable to carry your bags and suitcases. So if you like to show your love of English heritage then adding the handle wrap to your suitcase can make that happen. Some suitcases and bags are just have horrible handles that hurt your hands when carrying and for those situations they make handle wraps and now there is a rainbow handle wrap that even can have your name on it. 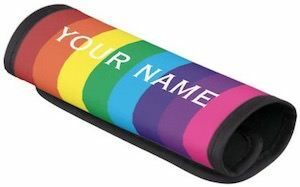 The handle wrap has lines of color just like a rainbow and then on top there is space for you name if you want (no extra cost) so that it becomes easy to spot you luggage. The rainbow luggage handle wrap is made from neoprene and connect by velcro so that it is comfy to use and connected in a way you won’t loose it. If you are looking for a bright luggage tag that is fun and can be made specially for you. The luggage tag has a red front and back and on the front it shows a crown with the text “Keep Calm This Is Not Your Luggage” and that is fun and maybe make people rethink stealing your luggage. On the back of the luggage tag you can choose to have the typical ID card slot so that you can write your own address cards or you can choose to have one that is personalized for you so that the back is printed with all your information on it and that looks really nice. If you are looking for the perfect luggage tag for your suitcase then check out this And We Are Off Luggage Tag. The luggage tag has fun arrows on the front with a green banner that says “and we’re off” but you can change that text if you like. The back is green and can have your info printed on it or you can choose a normal ID card slot like lots of luggage tags have. The luggage tag has a nice strong strap making it perfect for long time use and all that will prevent you loosing your bags or at least making it way less likely. If you like a cool luggage strap for on your suitcase then you want to check out this personalized luggage strap. 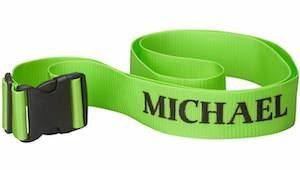 You can get this luggage strap in bright green, red, or yellow and all can have your name on it or maybe a different text. On your personalized luggage strap you can have up to 18 character so now you just need to think of what you like on your luggage strap. And this luggage strap is adjustable in size to make it fit tight around you suitcase. Just imagine having this cool strap around your luggage and how much easier to find your luggage on the luggage belt at the airport. If you want a cute and fun luggage tag made specially for you then you just have to check out this I am over here luggage tag. The luggage shows on the front your name and below it the text “Woo Hoo Here I Am Over Here” and on the back it will have your info. All the info is printed on the luggage tag and that makes it just perfect as you never have to worry about loosing the paper ID card. A fun bag tag like this make finding you suitcase fun every time and the green color also makes it easy to spot you luggage.